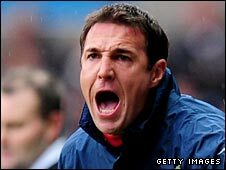 Former Celtic, West Ham and Norwich defender Malky Mackay has been named as the new Watford manager. The 37-year-old, who has been coaching at Vicarage Road since 2007, replaces Brendan Rodgers, who left the Hornets to join Reading. Mackay, who won three Scotland caps, had a spell as caretaker with Watford after Aidy Boothroyd left in November. The Scot, who ended his playing career at Vicarage Road, recorded two wins, a draw and two defeats while in charge. Former Watford midfielder Andy Hessenthaler, who has won promotion to Conference South with Dover since leaving his post as Gillingham player-manager, had expressed an interest in returning to the Championship club. Hornets chairman Jimmy Russo had reacted to the departure of Rodgers to his former club by promising that: "We will get a Watford person onboard. Somebody that understands the culture, somebody that understands the job in hand." Reading agreed a compensation package of £500,000, rising to a potential £1m, for Rodgers, who had steered Watford clear of relegation from the Championship. And he could target some of his former club's emerging talent during the summer transfer market. Assistant manager Dean Austin, football consultant Frank Lampard Snr and football physiologist Karl Halabi have already left Watford to follow Rodgers to Reading.